We are Platinum Distributors & Factory Certified Repair Center! 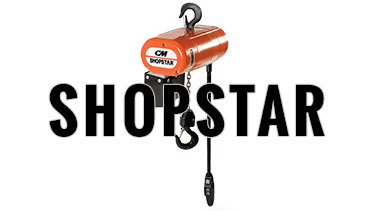 We Stock and Quick Ship CM LodeStar and ShopStar Electric Chain Hoists. 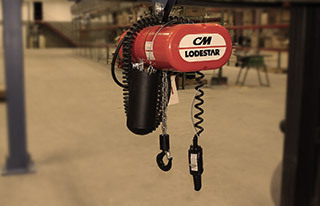 The CM Lodestar electric chain hoist is the industry standard for tough applications. It is made in the U.S.A. with units still in service for over 50 years! From the most recognized manufacturers in industry to show stoppers in arenas, night clubs and theaters, the LodeStar is the brand that more workers trust. For 50 years, the Lodestar has tackled the toughest jobs in the most stringent manufacturing environments around the globe. In entertainment, many of today's top performers rely on the inverted LodeStar or "Chain Motor" to delicately position lighting, scenery, and sound equipment. Next time you're hard at work in a manufacturing facility or relaxing at a rock concert or play, look up! 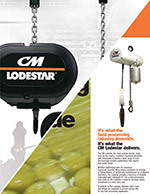 Chances are a CM LodeStar chain hoist is in place handling lifting and positioning needs. It's been that way for 50 years. 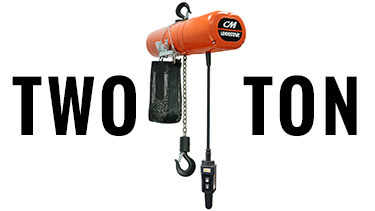 With its reputation for durability, reliability, and low maintenance, the same CM chain hoist may still be there a half-century from now. 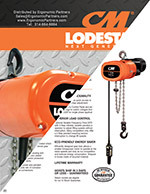 The balanced, integrated, proven design of the LodeStar has made it the most popular electric chain hoist in the industry. Disc type electric hoist brake. Machined alloy steel heat treated lift wheel. Heavy-duty hoist motor with regenerative braking. Over-capacity overload protector standard. No oil in the gear case with NO oil leakage! Gear train lifetime lubricated with non-oxidizing grease. Precision machined and hardened pocket wheel with hardened chain guides for precise chain pocket wheel fit. 1/8-ton to 3 ton capacities metric rated for heavy duty industrial applications. H-4 Duty is standard. 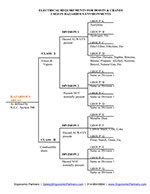 Meets ASME B30.16. Lifetime warranty. Solid state starting switch. Rugged NEMA 4 pushbutton station. Upper lower screw type limit switches are standard, with back-up reverse plugging limit switch. Hardened, forged steel, latch type hook and Hoist alloy load chain for long dependable service. 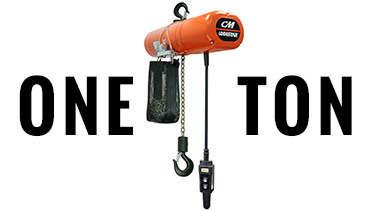 Made in the U.S.A. Each CM chain hoist is tested to 125% of rated capacity prior to shipment. 2069, 2070 2071, 2072, 2076, 2077, 2081, 2082 250 lbs. 2000, 2047 2026, 2029, 2086, 2087, 2074, 2075 300 lbs. 2090, 2089 2091, 2092, 2080, 2084, 2099, 2100 500 lbs. 2001, 2048 2035, 2038, 2106, 2107, 2105, 2114 600 lbs. 2110, 2109 2111, 2112, 2116, 2117, 2119, 2121 1000 lbs. What else can Ergonomic Partners do for your CM Electric Hoist? Metal Chain Container - Convenient for slack chain storage. Simple one pin attachment for easy installation. Security cable included. Fabric Chain Container - Fabric chain bags offer an alternative to the standard metal chain container for use with LodeStar or Valustar electric chain hoists. Chain bags are made from an open weave vinyl coated polyester designed especially for extended outdoor life. Excellent resistance to ultraviolet rays, mildew stains, rot and weather. Not recommended for applications over 300° F, or in extremely caustic environments or for chain weight exceeding 300 pounds. Bullard Hooks - Rugged cast swing gate locking member. The hook gate is intended to retain slings and other lifting devices under slack conditions only. The gate is not intended to retain the load. Hoist Top Suspension - Rigid Hook, Swivel Hook, Lug, Integrated Low Headroom Plain Push Trolley or Motorized Trolley. Clean room, hospital, pharmaceutical and Harsh environment CM hoists available for severe duty of plating, galvanizing and wash down applications. Hoists with climbing capability available for entertainment, temporary rigging or lifting applications - must be used in inverted position only. Adjustable frequency drives offer a 40:1 speed range compared to the typical 3:1 ratio that two-speed hoists motors offer. Frequency drives allow controlled acceleration and deceleration, and with their programmable micro-positioning control and inching control, allowing precise positioning and eliminating reverse plugging or jogging. These are provided under the hoist cover for hoisting motion. 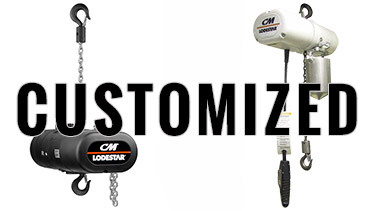 Hook mounted control station designed for single chain, one-speed LodeStar and Man Guard hoists. Aircraft style handle for right or left hand operation. Push buttons located at top left and at trigger positions for ease of operation. Lightweight but sturdy aluminum frame construction. 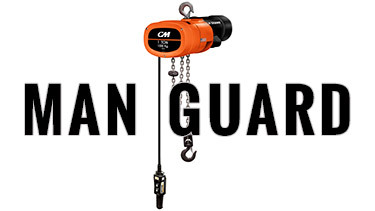 Easy installation on most small frame electric chain hoists. Made in U.S.A. One-year warranty on the handle. 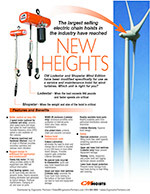 With wind energy as one of the fastest growing sectors of renewable energy technologies, CM has developed two Wind Edition hoists. 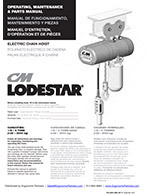 The CM Wind Edition LodeStar and ShopStar are specially modified for extreme long lifts and have been redesigned to create compact and rugged service hoists for the wind energy industry. Lift Heights Exceed 300 feet. Precision machined and hardened lift wheel reduces chain vibration. Zinc plated CM Alloy load chain. 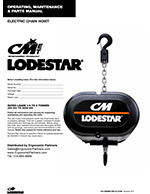 Hoist Standard Speeds: LodeStar single speed 32 fpm or 64 fpm standard. ShopStar 20 fpm standard. 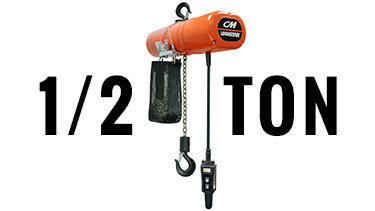 Two-Speed is Optional: Small frame Lodestar hoist 32/10 fpm / Large frame Lodestar hoist 64/21 fpm. VFD is available. Gear train lifetime lubricated with non-oxidizing grease -No oil leaks! Eliminates the need to drain and change the oil. Overload protection: Prevents lifting more than rated capacity. Dual braking system with electro-dynamic braking eliminates heat generated. Totally enclosed non-ventilated hoist frame protects motor from environmental contamination. NEMA 3R enclosure for LodeStar only. ShopStar NEMA 1 enclosure. Controls: 24V, 48V or 115V control voltage available. LodeStar 2 button, NEMA 4X. ShopStar 2 button, NEMA 4. Hoist Voltage: Single phase 115/1/60 optional, 230/3/60 or 460/3/60 standard, 575/3/60 or 380/3/50 also available. Hoist Top Suspension: Rigid Hook, Swivel Hook, Lug, and Integrated Low Headroom Plain Push Trolley or Motorized Trolley. Hardened forged steel latch style lower hook rotates 360°. Lower hook has impact protection preventing tower damage during no load lifting and lowering. 5:1 design factor. Lifetime warranty. Made in the U.S.A. Parts are readily available. Hoist Duty Cycle: Exceeds ASME H4 rating. Heavy duty motor provides ability to lift equipment over 300 feet without interruption. Standards: Meets ASME/ANSI B30.16. CE and CSA compliant units available CE and UL compliant units available. 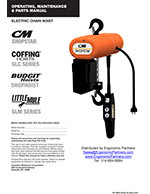 Let an Ergonomic Partners sales representative assist you in choosing the correct CM hoist for your application. Please contact Ergonomic Partners today. Ergonomic Partners is a factory authorized seller, distributor and repair center of electric chain hoists; serving clients from coast to coast, Canada, Mexico and especially focused in the states of Missouri, Illinois, Indiana, Kansas, Arkansas, Mississippi, Nebraska, Tennessee, Kentucky, Iowa, and Oklahoma.